What a fabulous day, beautiful weather, super heroes, new course records, stunning scenery and I have no doubt new friendships forged. All of this sums up the 6th running of Northamptonshire’s Ultra race which was again hosted in the stunning grounds of Lamport Hall. 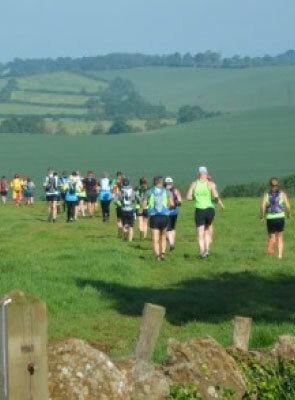 The race truly starts as the field of nearly 200 enters the rolling countryside of the county and heads off to visit its first country home, Cottesbrooke Hall. 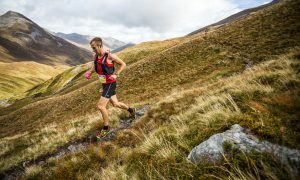 Superior navigating skills had Andrew Pace lead the field at the first three check points in close company with Dave Smithers and Jonathan Albon. However two ridiculously fast sub 44 minute splits for the last two stages put Jonathan into a commanding lead and to win in a new course record of 4:14:47. Andrew faded a bit between the last check point and the finish which allowed Dave to ease through to take second. In the ladies race Kate Whitfield was having a good day and was always the first lady on the course pretty much from the start and won in a time of 5:38:45. The race for the other two podium positions however was a much closer affair with Mary Ann Devally and Emma David in pretty close company until between check points 3 and 4 where Mary Ann opened a bit of a gap which she held to the finish despite a late charge from Emma. A good spread also in the age categories in the men Dave Smithers won the M40, Paul Dickens was the M50 winner and Richard Beard taking the M60. In the ladies there was, unusually, no competitor in the W60 category but Kate Whitefield won the W40 and Patricia Keene W50. As always the Go Beyond crew were fantastic, over 4000 bottles were being moved around the course to ensure that nobody went without the liquid they needed as well as the energy drink, energy drink tabs, gels, savoury snacks and of course the famous fruit cake. The estate team at Lamport have again been very supportive and I feel privileged that we get to base the race there. 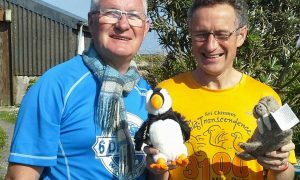 Lastly the runners who always compete in a great spirit which is supported by the war stories of how they have helped each other on the course.